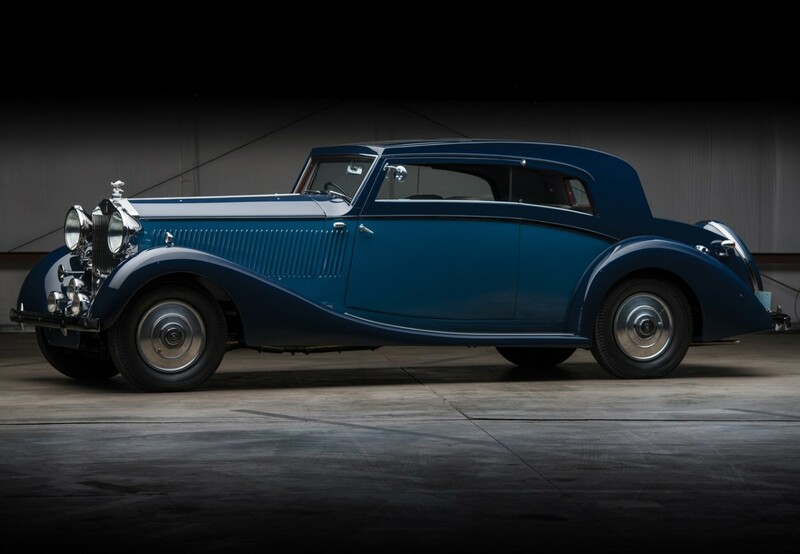 By definition, the Rolls-Royce Phantom III was not a sporty automobile. It was a huge car, introduced by Rolls in 1936 and it lasted through 1939. The bare chassis alone weighed in at just over two tons. It featured a big, 7.3-liter V-12 making about 160 horsepower, which was a decent amount of power, but not enough to scoot the pure massiveness of this car along at any decent clip. But, I suppose, that has never been the point of a Rolls-Royce, V-12 or otherwise (the Phantom III was the first V-12 RR and the last one until 1998). Because these were sold as bare chassis, it was kind of up to the coachbuilder of your choice to make it seem sporty and that is where Vesters & Neirinck of Brussels succeeded wildly with this car. The low, extremely solid-looking roof, swoopy fenders and two-tone paint really do make this car look sporty. And the fact that it lacks B-pillars is icing on that design cake. Now let’s talk about this car’s downright bizarre ownership history. It is said that during WWII this car was used by the King of Belgium and Field Marshall Bernard Montgomery. In the late 1950s the car was in Germany and a decade later it was in the U.S. where it had a series of owners. Then, in the 1980s, it was purchased by G. Gordon Liddy (of Watergate infamy). He sold it to Charles Nelson Reilly, who, because he was way before my time, became known to me thanks to Alec Baldwin’s not-as-over-the-top-as-you-might-think impression of him on Saturday Night Live. Restored between 1992 and 1994, this car won its class at Pebble Beach and has been in the same collection for nearly 20 years. Only 727 Phantom IIIs were built and this is, so far, the best-looking example I’ve seen (though we featured another wild one a few weeks ago). It should bring between $550,000-$750,000. Click here for more info and here for more from this sale. This entry was posted in Uncategorized and tagged 1937, auctions, cars, classic cars, phantom iii, pillarless saloon, rm sothebys, rolls-royce, vesters & neirinck by classiccarweekly. Bookmark the permalink.